Oh, the hundreds of hours I have spent with The Disney Afternoon. A programming staple of syndicated television, this two hour block of original Disney programs ran in various forms on broadcast television for most of the '90s and was a huge influence on many a kid. Actually, the show that launched Disney as a syndicated giant was Ducktales all the way back in 1987, before The Disney Afternoon even existed as a brand. In the late '80s, I would come home from school, grab a snack, and watch the adventures of Scrooge McDuck and his nephews from 4 p.m. until 4:30. It's impossible to oversell how important Ducktales was for my age group; it combined the Disney characters I'd always known with an adventurous storytelling style straight out of Raiders of the Lost Ark. 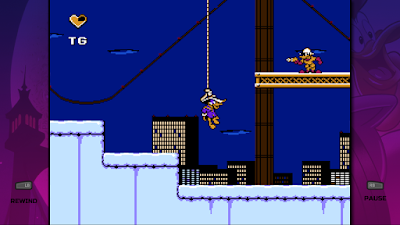 Scrooge McDuck traveled the globe looking for treasure and outwitting his foes at every turn. One of my greatest pleasures has been to revisit the show as an adult and pass it on to my own kid. The stories are smart, fun, and still feel exciting. Within just a few short years after Ducktales, Disney had developed a whole roster of shows that they packaged together, basically owning the airwaves for millions of kids worldwide. We had Chip 'n Dale Rescue Rangers, which featured the iconic chipmunks as heroes for hire, and Tale Spin, which recast the characters from The Jungle Book as South American cargo runners. At various points throughout the '90s, other shows filled out the two-hour slot, including Goof Troop, Disney's Adventures of the Gummi Bears, and Darkwing Duck, which was the favorite of many. 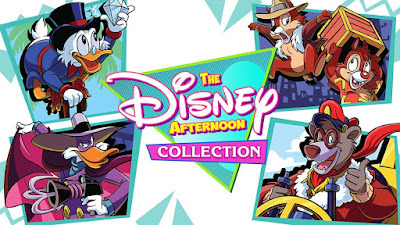 Even after Disney left syndicated television and started showing their cartoons on their own cable channels, shows from The Disney Afternoon continued in some form until 2008, meaning that Disney had been a part of after-school television for over two decades. But the games. Oh, the games! When we weren't watching the shows themselves, we were playing the Nintendo games based around them. 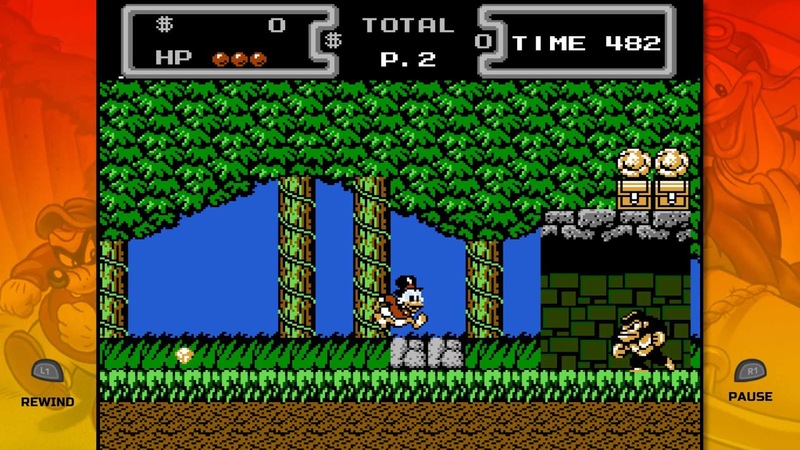 I received the NES Ducktales for Christmas in 1989 and played it daily. I hear other people comment now about how tough the game was, but I guess I never noticed because I had the entire game memorized. Capcom developed that release and its sequel as well as other games based around the other shows. Most agree that these video games were some of the most fun and successful licensed titles ever made. Now Capcom has finally decided to re-release six of these games for modern players with The Disney Afternoon Collection, a downloadable bundle for Playstation 4, Xbox One, and Microsoft Windows. In maybe the ultimate irony, this collection isn't available to play on a Nintendo system like 3DS or the Wii U. The games themselves are Ducktales, Ducktales 2, Chip 'n Dale Rescue Rangers, Chip 'n Dale Rescue Rangers 2, Darkwing Duck, and Tale Spin. 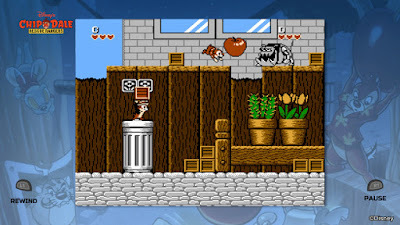 This isn't the first time Capcom has flirted with their Disney past; back in 2013, they partnered with WayForward Technologies to release Ducktales Remastered, which offered a shiny presentation of the classic game with new voice performances, updated graphics, and a full score. It was fun, but it wasn't the game that many of us had grown up with. Thankfully, Capcom has left the graphics and gameplay for the six games in this collection completely untouched. They still even have the Nintendo controller instructions, like "Press A or B," on the screen. There have been some modifications, but they are welcome. We now have a "rewind" button that allows players to literally rewind the gameplay so that they can avoid on-screen damage and death. There are also the always-welcome save states, as well as a few new modes like "Boss Rush" and "Time Attack." Rounding out the package is the addition of of concept art and unlockables that are sure to please fans. While the collection is in HD, you can adjust the in-game settings to make it look like you're playing it on an old-school tube TV if you're nasty. These ports of the classic games were developed by Digital Eclipse, the same guys behind the very-successful Mega Man Legacy Collection from 2015. Some gamers will recognize the names Frank Cifaldi and Mike Mika, both of whom are leaders in the realm of video game preservation and have been associated with some very high-profile restoration projects. Frank Cifaldi is the guy behind lostlevels.org, a website dedicated to the history of games that never made it to stores. He's also the founder of The Video Game History Foundation, a group of preservationists who seek to archive the history of video games, including all associated marketing ephemera like commercials and print ads. Mike Mika is also a founding member of this group. 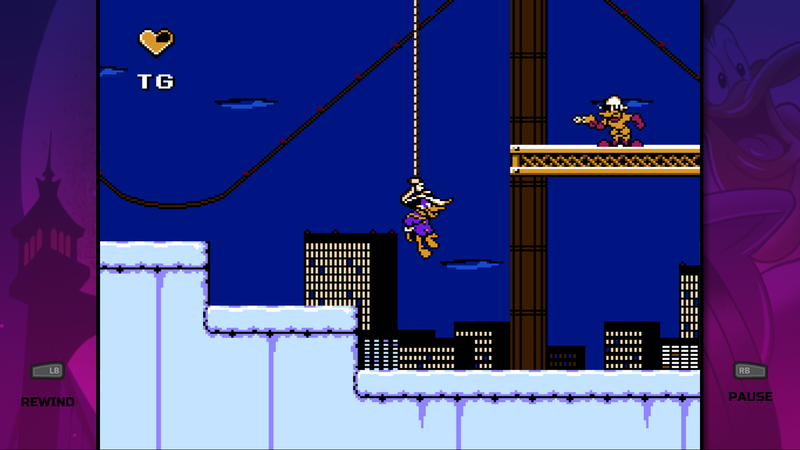 Clearly The Disney Afternoon Collection was a labor of love for everyone involved. I can't think of a group of people I would rather have in charge of something like this. This is the A-team. I pity the fool that hires someone else to restore their game! The only major complaint that I have about this collection is that it's not getting a physical release. I know physical releases for these sorts of retro bundles are becoming a thing of the past, but I still think that many old-school gamers would snap this up like one of Mrs. Beakley's home-cooked treats. I guess we aren't going to get an opportunity to add a hard copy of the game to our shelves unless someone like Limited Run Games somehow gets the chance to offer a small print run for purchase. There are also currently some crashing problems associated with switching games in the menu, but these could be fixed via a patch. Those caveats aside, this is an outstanding collection of six incredible games (well, maybe five; Tale Spin isn't quite in the same league as the rest) for a price tag of $20. You would be hard pressed to find even one of these games on the retro market at that price, let alone the rare, expensive sequels. Throw in a the rewind ability, the save states, and all the fun extras that the programmers threw in, and you've got a package that is a must-have for fans of Disney or old school video games. It's not just blind nostalgia, either; these games still look and play great and have aged incredibly well. This one gets my highest recommendation. In fact, I'm awarding this collection the coveted Golden Spoon Award for outstanding value and fun. If you ever loved these games, or even if you've ever been curious about them, this one's for you. The DuckTales games are the highlights here which isn't too surprising given that a lot of the people at Capcom that worked on the Mega Man games worked on the DuckTales games as well. The first game had a great soundtrack too (Video game music coverband The Advantage does a good rendition of the Moon level music).